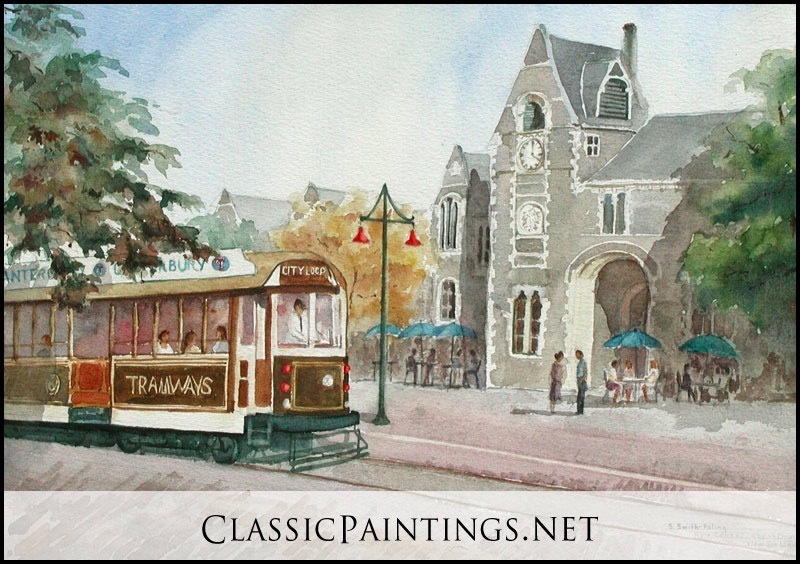 W/C Arts Center, Christchurch New Zealand The art center at ChristChurch, New Zealand is delightful to paint. The stone buildings are the original University of Canterbury. Now they house visual and performing arts. The outside cafes, electric trolley cars and the museum add to the very enjoyable afternoons I spent there while in support of "Operation Deep Freeze" for the US Air Force in Antarctica. W/C Regent's Street, Christchurch New Zealand This section of Christchurch has a Spanish or Moorish influence and is an old quarter that has been renovated. The colorful building facades, balconies, flower boxes and out door cafes are not only beautiful, but both restful and inspiring. This was my second deployment to ChristChurch, New Zealand and Antarctica. When not on the ice I had time to paint and explore the South Island of New Zealand. It is quite spectacular. This time I was on the C-17 and we had spectacular views of the ice flows, the ice breakers and Mt Aribus around McMurdo station. On my first trip I spent three weeks as a flight surgeon for the USAF based out of ChristChurch. I took care of the flight crews and had the experience of being part of the cockpit crew of a C141 as we landed at McMurdo Station, Antarctica. We had two navigators as well as three pilots who constantly checked our position, winds, weight as we approached the PNR or PSR (point of no return or point of safe return) where we would have to turn back if our fuel consumption was too great. There was no place to land from the PNR to McMurdo if we ran out of fuel. The penguins walked 30-50 miles from the coast just to look at the airplanes out of curiosity! 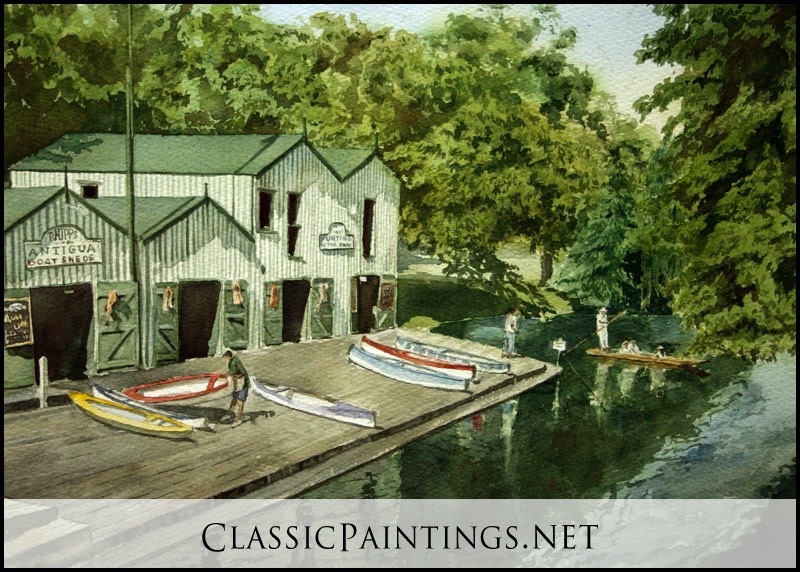 W/C Punting, kayaking or canoeing are delightful ways to explore the river Avon in Christchurch. My husband Mitch and I not only enjoyed a lovely, lazy canoe trip, but we also had afternoon tea, pastries at the outdoor café at the boat shed. 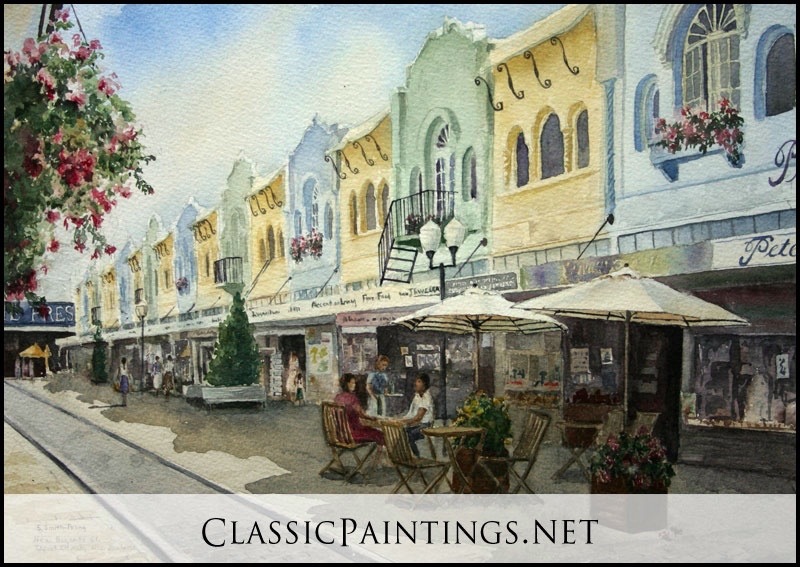 It was so very picturesque, restful and a delight to paint. This was my second deployment to ChristChurch, New Zealand and Antarctica. 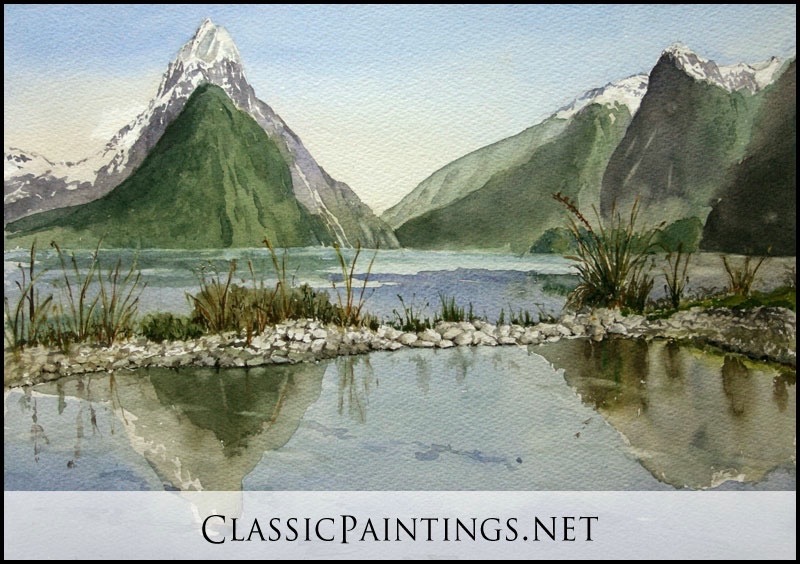 When not on the ice I had time to paint and explore the South Island of New Zealand. This time I was on the C-17 and we had spectacular views of the ice flows, the ice breakers and Mt Aribus around McMurdo station. On my first trip I spent three weeks as a flight surgeon for the USAF based out of ChristChurch. I took care of the flight crews and had the experience of being part of the cockpit crew of a C141 as we landed at McMurdo Station, Antarctica. We had two navigators as well as three pilots who constantly checked our position, winds, weight as we approached the PNR or PSR (point of no return or point of safe return) where we would have to turn back if our fuel consumption was too great. There was no place to land from the PNR to McMurdo if we ran out of fuel. The penguins walked 30-50 miles from the coast just to look at the airplanes out of curiosity! W/C Milford Sound, New Zealand Milford Sound is breath-takingly spectacular. It is on the southwest coast of the South Island of New Zealand. When I saw it, I knew I had to paint it! All of the South Island is still very pristine and spectacular. I hope I captured a little of its feeling. This was my second deployment to ChristChurch, New Zealand and Antarctica. When not on the ice I had time to paint and explore the South Island of New Zealand. This time I was on the C-17 and we had spectacular views of the ice flows, the ice breakers and Mt Aribus around McMurdo station. On my first trip I spent three weeks as a flight surgeon for the USAF based out of ChristChurch. I took care of the flight crews and had the experience of being part of the cockpit crew of a C141 as we landed at McMurdo Station, Antarctica. We had two navigators as well as three pilots who constantly checked our position, winds, weight as we approached the PNR or PSR (point of no return or point of safe return) where we would have to turn back if our fuel consumption was too great. There was no place to land from the PNR to McMurdo if we ran out of fuel. The penguins walked 30-50 miles from the coast just to look at the airplanes out of curiosity! W/C Mount Aribus, Mc Murdo, Antarctica Mt. Aribus is an active volcano. Nestled just below it is McMurdo, the United States research station operated by the National Science Foundation. 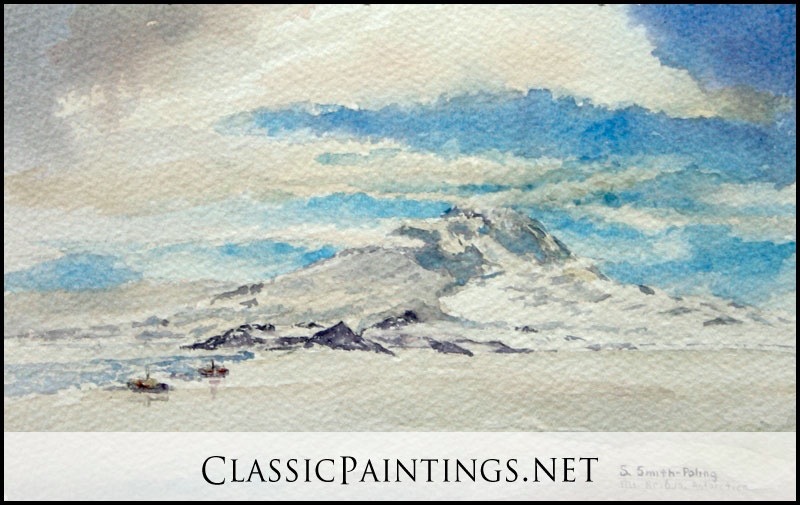 I was fascinated by the size of the mountain, the vast snow fields and how small the ice breakers appeared in comparison. The sky, clouds, warm and cool shadows were very inspiring and I just had to paint them. This was my second deployment to ChristChurch, New Zealand and Antarctica. This time I was on the C-17 and we had spectacular views of the ice flows, the ice breakers and Mt Aribus around McMurdo station. On my first trip I spent three weeks as a flight surgeon for the USAF based out of ChristChurch. I took care of the flight crews and had the experience of being part of the cockpit crew of a C141 as we landed at McMurdo Station, Antarctica. We had two navigators as well as three pilots who constantly checked our position, winds, weight as we approached the PNR or PSR (point of no return or point of safe return) where we would have to turn back if our fuel consumption was too great. There was no place to land from the PNR to McMurdo if we ran out of fuel. The penguins walked 30-50 miles from the coast just to look at the airplanes out of curiosity! W/C What's Next? 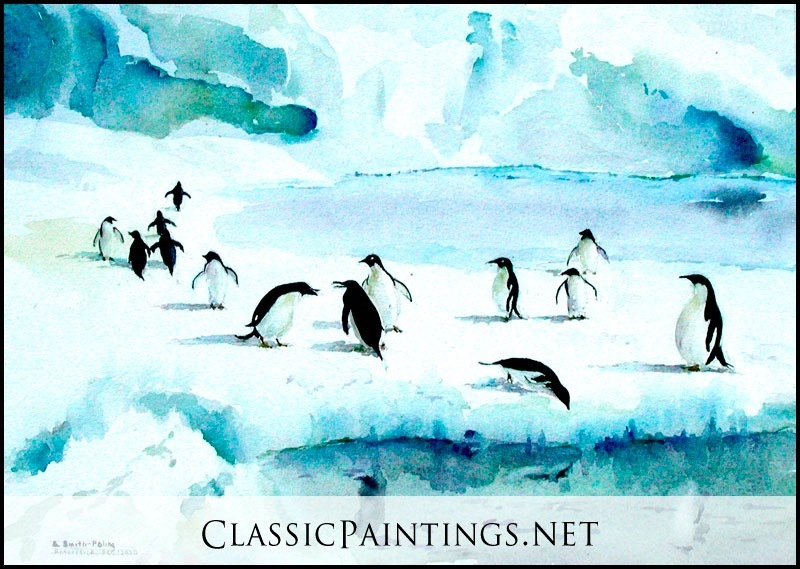 Penguins in Antarctica Penguins are fascinating and fun to study and paint. This was my second deployment to ChristChurch, New Zealand and Antarctica. This time I was on the C-17 and we had spectacular views of the ice flows, the ice breakers and Mt Aribus around McMurdo station. On my first trip I spent three weeks as a flight surgeon for the USAF based out of ChristChurch. I took care of the flight crews and had the experience of being part of the cockpit crew of a C141 as we landed at McMurdo Station, Antarctica. We had two navigators as well as three pilots who constantly checked our position, winds, weight as we approached the PNR or PSR (point of no return or point of safe return) where we would have to turn back if our fuel consumption was too great. There was no place to land from the PNR to McMurdo if we ran out of fuel. The penguins walked 30-50 miles from the coast just to look at the airplanes out of curiosity! W/C Who's Egg? 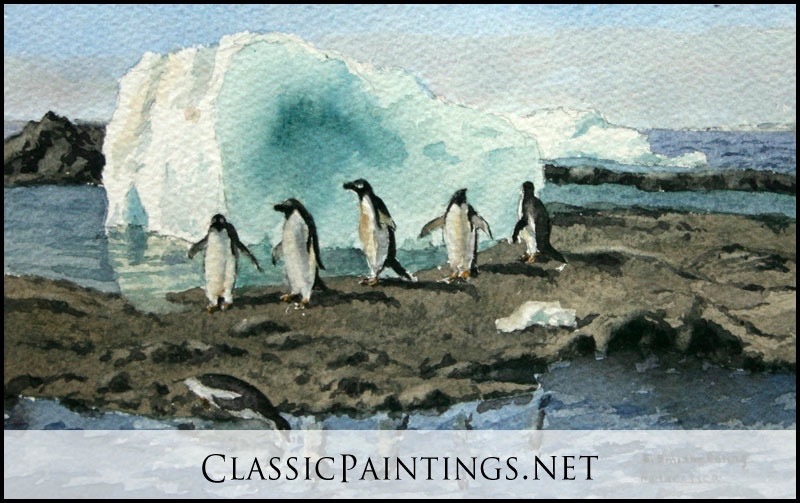 Penguins in Antarctica Penguins are fascinating and fun to study and paint. The male penguin incubates the egg for weeks while the female goes and eats and gets fat. When she returns, the male must give up the egg for her to then finish incubating and feed while he feeds. Sometimes the males have grown so attached to taking care of the egg or hatching, that they do not want to give it up. This was my second deployment to ChristChurch, New Zealand and Antarctica. This time I was on the C-17 and we had spectacular views of the ice flows, the ice breakers and Mt Aribus around McMurdo station. On my first trip I spent three weeks as a flight surgeon for the USAF based out of ChristChurch. I took care of the flight crews and had the experience of being part of the cockpit crew of a C141 as we landed at McMurdo Station, Antarctica. We had two navigators as well as three pilots who constantly checked our position, winds, weight as we approached the PNR or PSR (point of no return or point of safe return) where we would have to turn back if our fuel consumption was too great. There was no place to land from the PNR to McMurdo if we ran out of fuel. The penguins walked 30-50 miles from the coast just to look at the airplanes out of curiosity! W/C Penguins A whimsical portrayal of penguins painted while on location in ChristChurch, New Zealand and McMurdo station, Antarctica. I spent three weeks as a flight surgeon for the USAF based out of ChristChurch. I took care of the flight crews and had the experience of being part of the cockpit crew of a C141 as we landed at McMurdo Station, Antarctica. We had two navigators as well as three pilots who constantly checked our position, winds, weight as we approached the PNR or PSR (point of no return or point of safe return)where we would have to turn back if our fuel consumption was too great. There was no place to land from the PNR to McMurdo if we ran out of fuel. 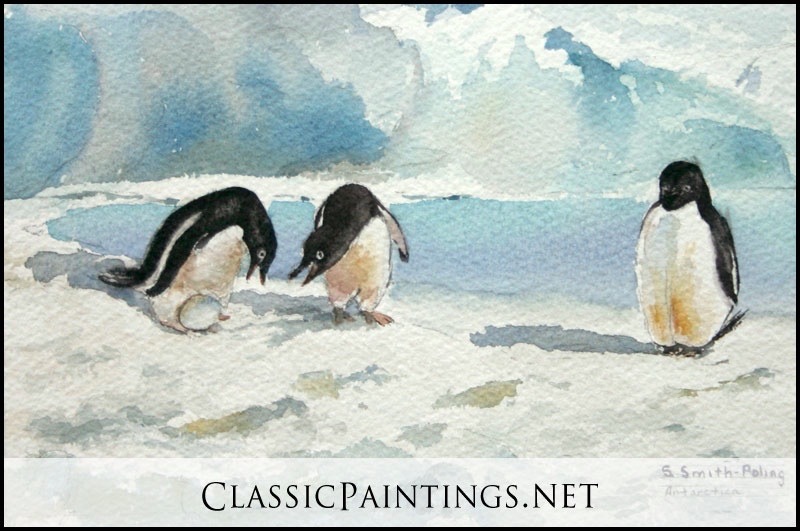 The penguins walked 30-50 miles from the coast just to look at the airplanes out of curiosity!